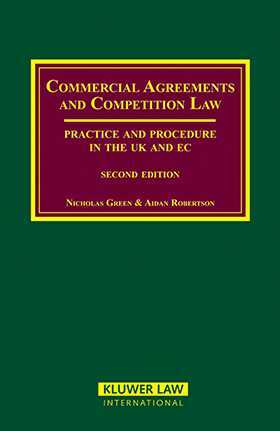 This authoritative and popular reference work examines the procedure and practice relating to commercial agreements and trade association practices under UK and European Community (EC) competition laws. Part I covers procedure in both the UK and EC. Part II then provides a detailed comparative analysis of all the major types of commercial agreements and trade association practices in both UK and EC law. Since much of competition law is, in practice, effectuated by administrative rather than judicial bodies, informal administrative solutions applied by the authorities receive full treatment. However, it also includes in-depth analysis of all the major cases, reflecting the increasing amount of competition law subject to litigation. The work also fully examines the EC block exemptions and recent developments in UK competition law. Commercial Agreements and Competition Law remains the only work to provide a detailed examination of the practice of the UK authorities, particularly of the Office of Fair Trading. It offers a detailed analysis of cases on the Register of Restrictive Trading Agreements and the Exempt Register. These components, along with its unique balance in focus between applicable informal administrative solutions and case holdings from litigation makes this work an unparalleled resource for practising lawyers, businesses, and their advisers dealing with the highly complex UK position.